With macOS officially supporting eGPU's this installation was incredibly easy to get set up and running. This implementation guide is simply here to prove that this setup works and to write about any issues I face with the setup in the hopes that this will help someone who may have this setup. Setup is straightforward, It is literally plug and play. My RX480 + Akitio Node was detected straight away and a simple log in and log out was all that was needed to activate the eGPU. Make sure Node is fully up to date, if it isn't follow this tutorial. Clamshell mode seems to be working great now in public beta 2. A question that seems to get asked a lot is "How well does final cut perform?". With this setup my BruceX 5K Export time was 19 Seconds vs 30 from the internal dedicated GPU. A modest improvement. Final cut Pro will crash if launched in clamshell mode, It will open if you first have the Mac Opened and then put it into clamshell mode. Transitioning from a TB2 to TB3 Mac. Having switched from a late 2013 13" MacBook Pro I thought I would quickly touch on this. As other's have stated there is no real performance gains from going from tB2 to TB3 unless you are trying to accelerate the internal screen. However it makes the setup a lot easier to manage as you can hot plug the eGPU without the system crashing. @jonwatso Would you mind sharing more of your experience when using FCPX with eGPU? I know the BruceX is a good start to gauge the performance improvement but many would like to learn more about the whole process. One of the things that originally attracted me to an external Graphics card was the ability to increase performance in applications that utilised hardware acceleration like Final Cut and Photoshop etc. 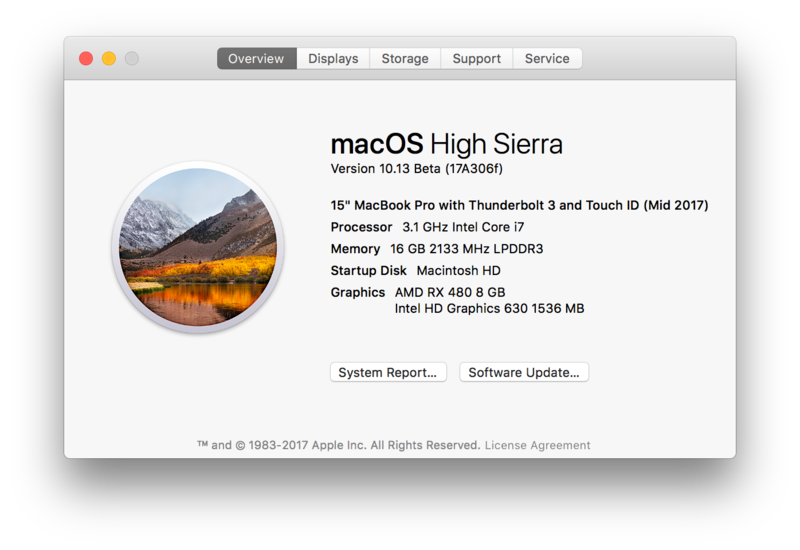 Owning a Late 2013 13" MacBook Pro meant that applications which required graphics performance always lagged and caused the whole experience to feel rubbish as I only had intel integrated graphics. Adding an eGPU setup to allowed me to to play around with higher resolution files in final cut without any real lag coming from the time line. Exporting files is where you really see the full potential of an eGPU. After purchasing my 2017 15inch MacBook Pro with the RP560 the performance gains weren't nearly as impressive. Like others have stated on here, due to the fact the dedicated GPU is connected to the logic board you will find that it out performs the eGPU in some tasks even the eGPU is a much faster card. I feel like we will start to see the true potential of eGPU's once metal 2 is impelled as it will do a better job of leveraging the dedicated graphics with the external graphics. Imagine if you could harness the power of your dedicated graphics along with your external, we would see quite the performance gain. High Sierra beta with Final Cut. For a MacBook Pro like my one which has a dedicated graphics card, you need to make sure that the dedicated GPU is running before you start final cut. This is super easy to do, just ensure that automatic graphics switching is turned off and then start final cut. MacBook Pro's with integrated graphics may need to have their integrated graphics card driver files removed to force the Mac to use the eGPU. I've seen others have success by changing the colour bit rate to 10-bit. As it currently stands my conclusion is this. If you have a Mac with integrated graphics then buying an eGPU is a great idea to do. If you have a Mac like mine with a dedicated graphics, I would suggest waiting for Metal 2 support for external graphics before purchasing an external graphics card because as it currently stands the performance gains aren't worth the price but I do believe metal 2 supported apps will change this. Feel free to ask any questions, I am no expert in this field so please take my comments with a grain of salt and please correct me if I have said something incorrect. One of the fun things about egpu.io is all the stuff you learn from all the clued up people on here.